Riding is good exercise and a skill that can be enjoyed throughout a lifetime, no matter where you live. 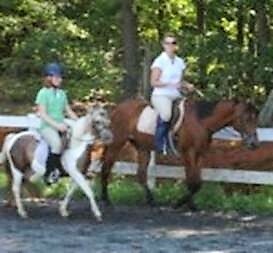 RIDING IS AS VARIED AS PEOPLE AND HORSES. 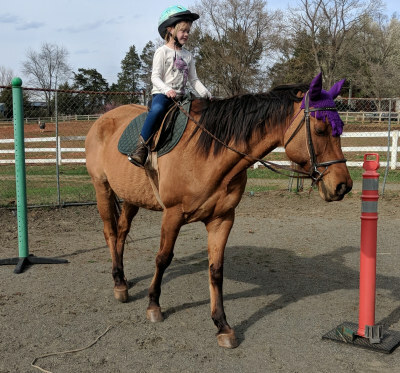 THERE ARE LITERALLY A THOUSAND WAYS TO ENJOY HORSES AND OUR MAIN OBJECTIVE IS TO TEACH THE SKILLS THAT WILL ENABLE EACH RIDER TO PURSUE THEIR OWN GOALS. 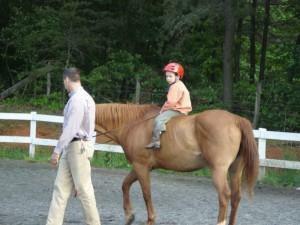 OUR EMPHASIS IS ALWAYS ON DEVELOPING CONTROL AND COMMUNICATION WITH THE HORSE IN A SAFE MANNER. We are careful to consider the goals of each rider. 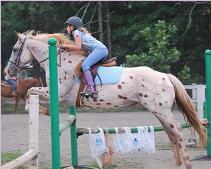 Some may want to jump and show over fences, others may just want to ride for recreation. 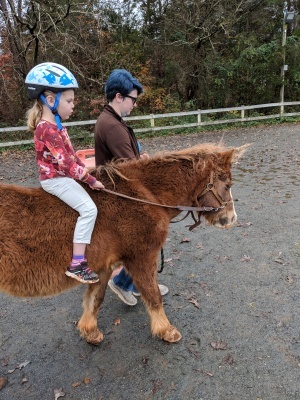 Any age for the rider with competent control. We like to mix levels so newer riders can see what more experienced riders do and the skills they need. Classes are never more than a 5-1 ratio. 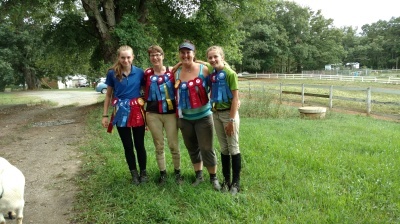 These classe start students out on their lifelong love of horses. 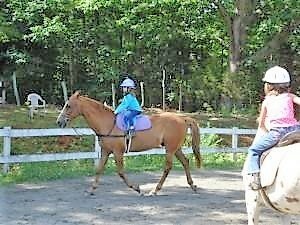 Given in the confined space of a round pen to insure safety and success with an emphasis on controling the horse as an independent rider. We work on patience and determination, learning that sometimes you have to try more than once to get something done! 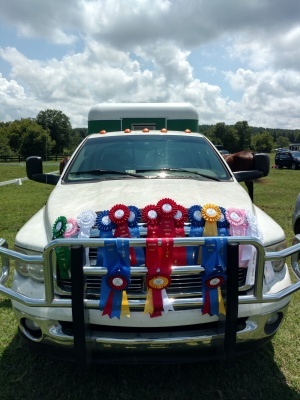 We have a strong show ring record with many year-end and show championships. Our students will often move from one horse to another. 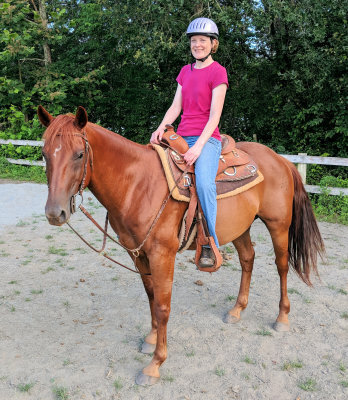 Each horse is an individual and they all have something different to teach and we think it is important to feel confident as a rider, on a variety of different horses. This also helps students evaluate what they like in different horses and riding styles. 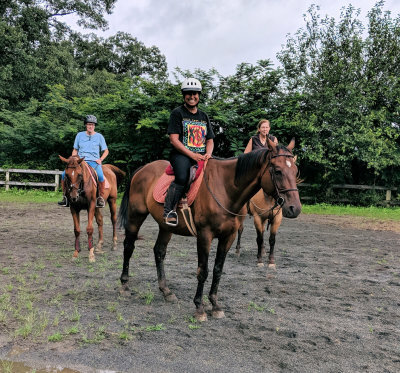 We have developed a number of different programs to serve the needs of active horse lovers and those who would like to become active horse lovers. We teach all levels and all ages from the beginner to those who want to show, and from the very young to the very old. And we have a strong commitment to the community, with several innovative programs that extend out into the community such as our Partners for Health and Recreation. 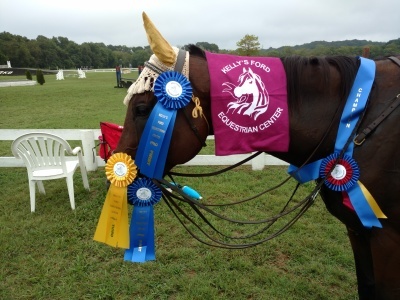 It is important that every horse does a job he or she enjoys and we assign horses according to student level and goals. It is also important that each student be able to move at their own pace, with enjoyable goals and not get shoved down one path. It is important to us to have a relaxed, low pressure atmosphere in the barn.